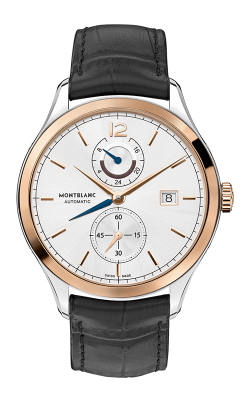 The perfect timepiece awaits, and with Montblanc, you will not have to wait much longer. Built with craftsmanship and high quality engrained in their watchmakers, they look to craft only the finest in luxury and high-end timepieces. This German watchmaking company creates extravagant pieces in watches, jewelry, and writing instruments. For over 100 years, Montblanc has been designing brilliant masterpieces in fashion and jewelry. 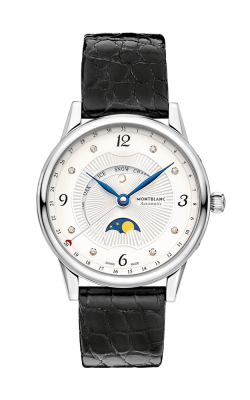 Montblanc offers both ladies’ and men’s watches in a variety of case and band materials from gold, carbon fiber, ceramic, leather, and many more. Experience the extravagant collection of Montblanc watches in our Oak Brook Terrace showroom today. The Meistruck Heritage collection boasts watches with a striking and clean watch face. The Star and Star Classique Collections offer watches for both men and women, all watches helping to ensure you can tell time with its unmistakably well-fashioned aesthetic. For watches with more flare, Montblanc presents the Boheme Collection of watches, giving you a chance to stand out from the average. With number styles in both Arabic and Roman Numeral, you can find a host of stand out watches. From skeleton dials that let you see the intricate interworking of the band to more traditional dials with built-in date complications, there is truly a watch for all. Those looking for unique dial structures, the Nicolas Rieussec Collection utilizes rotating discs and an off-center subdial. Find your ideal Montblanc watch today, and always be on-time. Why Shop Merry Richards Jewelers? Experience these timepieces in-person at the Oak Brook, Illinois, Merry Richards Jewelers. We specialize in fashion, fine, and bridal jewelry. We are an authorized retailer, so you know all of our products are authentic. We offer a lifetime diamond upgrade on diamond purchases at our location. We also offer layaway options with the ability to pay up to 6 months’ worth of monthly payments for your ideal jewelry piece. We offer a host of today’s top designers in fashion jewelry from Tacori to Simon G. Witness Montblanc and other top designers today at our showroom or give us a call for more information at 1-630-516-8000.